Hats and Rabbits: "Thanks, Jasmine"
There is an argument to be made, of course, for our complaints when they can be categorized as "first world problems." Louis CK does a great interview with Conan O'Brien in which he references our lack of appreciation for the incredible technology we have. He speaks of people complaining about small things about their airline flights and he reminds them that they should be constantly amazed in flight. He reminds them: "You're sitting in a chair in the sky." What more do we want, right? But...what if, thirty years ago, you were on the phone in your office and you needed a pad of paper on which to write an important note and there was none to be found? You'd have flipped out and gotten angry, because the convenience/necessity of a notepad was not available, right? This morning, I came in to school and had a million things facing me from the first second. The first task was to check and respond to emails. The first email of the day was to a teacher and I needed only to send: "Thanks, Jasmine." It should have taken about six seconds. This took me more than fifteen minutes to do, because my email kept freezing. Four "force quits," two "restarts," multiple profanities and one floor-crawling switch from wireless to wired connection later, I got the email to work. I guess one could argue that I am spoiled -- but the whole worth of this technology is for it to make things faster and easier. When it does not work, our flow is destroyed. I think a little anger is justified. 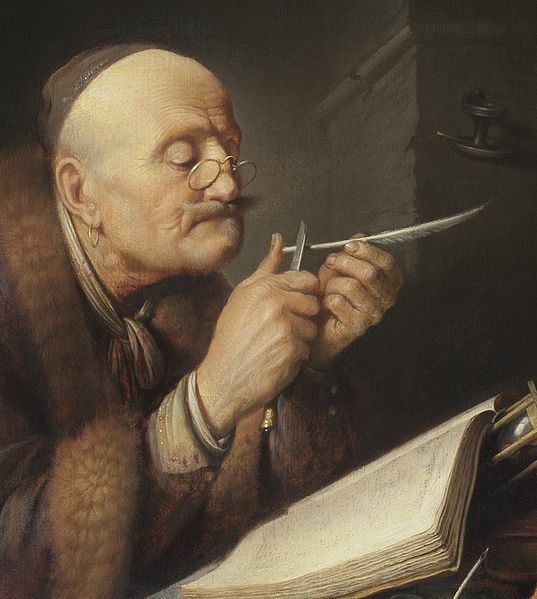 I wonder if, some time in history, there was an old guy and a young guy in a room and the young guy cursed because his quill point broke and the old guy said, "Dude. What more do you want? You dip a feather into ink and you can write...and you are going to complain when your point breaks? We used to have to chisel words into stone and if you messed up you couldn't just cross it out..."